When Colt Anderson stepped onto Qwest Field in Seattle Dec. 1, he felt one of the most powerful emotions an athlete can enjoy: The sense of playing at the absolute peak of his abilities. Anderson, a college walk-on who once cleaned gas stations before he could earn a scholarship, an undrafted free agent who began his NFL career on the practice squad, was drawing attention as a potential Pro Bowler on special teams. Each week, the undersize safety would sprint through a thicket of kickoff and punt blockers to make important tackles. In a year that was a wreck of disappointment for the Eagles, he was an overachieving positive. "That game I was feeling the best I ever felt," he recalled this week. "Feeling fast and explosive, almost untouchable." That Thursday night, with the damp Seattle air adding bite to the cold, close to 300 friends and family from Anderson's hometown, Butte, Mont., were in the stands. It was the closest NFL city to his home, and in Butte they had organized a road trip to raise money for a teen fighting cancer at Anderson's old high school. Children and adults wore maroon University of Montana jerseys with "Anderson" on the back. On the game's opening kickoff two Seahawks linebackers targeted the 194-pound Anderson, riding him to the turf. He sprung up and still stopped Leon Washington. That was Anderson's last tackle. In the second quarter, racing to cover a punt, he planted to cut and felt three pops in his left knee. "To be at the highest of highs, with your family all around, to being at the lowest of lows when I'm walking off the field," Anderson said. "I'm a pretty emotional guy, and I didn't feel anything [in the knee]. It wasn't hurt. It was just weak, and I was just crying because I knew my season was over. I wasn't crying because I hurt." Anderson had torn his anterior cruciate ligament. It was the first major injury of his career. He is hopeful, though, that he will be back making plays in the Eagles season opener Sept. 9, nine months and one day after ACL surgery. "I'm feeling really good. I'm right on track to get back, but it's just a process. It's a day-by-day thing where you can't get too far ahead of yourself," he said. "We'd like to get back before the season and be 100 percent by then." As with any ACL tear, it has been a long road for Anderson, with a return to play hovering far in the distance. "Its been demanding mentally and physically because that first month you're a little bit depressed. . . . You see your team out there playing, and you wish you could help them out, but you're stuck in the training room," he said. Instead of improving this offseason, he'd have to work hard just to get back to the way he felt before his injury. "After that first month, it was time to stop feeling sorry for yourself and get at it," he said. 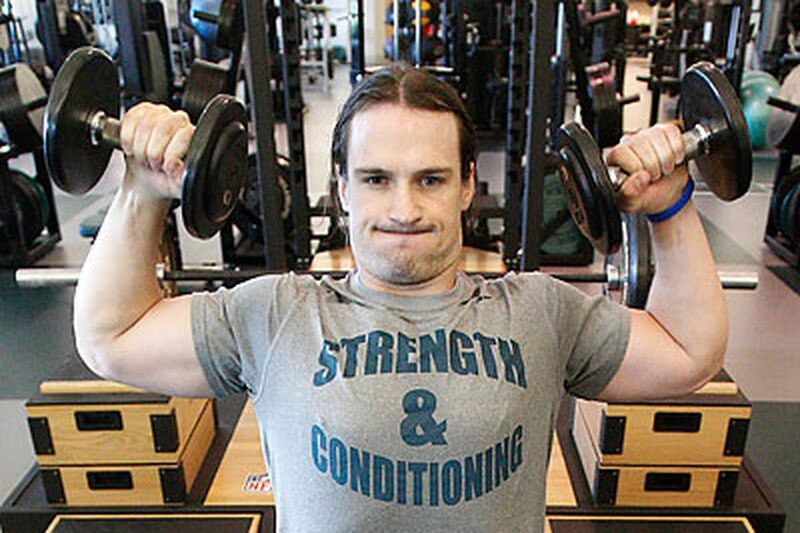 He has spent nearly every day since the Eagles season ended at the team's NovaCare Complex from nine to noon for rehabilitation and lifting. Anderson, whose son, Cage, was born in October, is engaged to be married in May. But after a weekend back home for the wedding, he half-joked that his honeymoon will be in South Philadelphia with Eagles trainers. He won't be going away with his wife this summer. Instead, he'll be trying again to work his way onto the field, as he always has. At Montana, Anderson, who didn't have a scholarship, cleaned gas stations to help pay rent after his true freshman year. He power-washed driveways, cleaned pumps, changed air filters, wiped down lightbulbs. The next spring, Anderson juggled conditioning, lifting, classes, and offseason practice during the day and took bartending shifts from 6 p.m. to 2 a.m. Leading into his sophomore year, he moved from being a third-string safety in spring practices to a starter by opening day and earned a partial scholarship that would eventually become a full ride. But he again faced a difficult road to playing time after college, going undrafted and spending a season and a half on Minnesota's practice squad before the Eagles picked him up in November 2010. He made such a special teams impact in just eight games that teammates voted Anderson a captain in the playoffs. He was making an even bigger impression last season before his injury. Asked if he reflects on how far his career has come, he said his long climb still drives him. "I use the practice-squad mentality I had. It's similar to a walk-on mentality as far as you're trying to earn a scholarship. You're trying to earn that 53-man roster, and so I have that same mentality to this day where I'm just fighting for a job," he said. "I don't necessarily reflect, but I use that same mind-set to keep going." His recovery started with restoring flexibility - at first his knee could only bend 15 degrees - and then quickly moved to strengthening his injured leg. Recently, he began running again, outside, on a treadmill in a pool and on an AlterG machine, a treadmill with a pressurized bubble that eases the weight on his legs. Cameras monitor his gait. "You actually do learn how to walk again," he said, wearing a purple T-shirt and black "Uptop" hat, a clothing line he and a brother created and are trying to build in Montana and online. "You learn to walk without a limp and then you learn to jog and then you learn to eventually sprint." Anderson's first call after his injury was to high school teammate Jason Rixford, who went through three ACL tears but still managed to play his senior year in college. Anderson thought of former Vikings teammate Cedric Griffin, who shredded opposite ACLs in 2009 and 2010 but played every game in 2011. He got encouragement from Eagles receiver Jeremy Maclin, who recovered from a tear as a college freshman to become one of the nation's top players. "That helped, hearing guys go through it and then being able to come back from it," Anderson said. Looking ahead, he hopes to get back to that feeling he had in Seattle, "just to pick up where I left off." Then, maybe next summer, he said, he'll take that honeymoon, and perhaps reflect on a successful rebound.